By far the most popular market in Bunker Hill was the Grand Central Market, originally opened in the Homer Laughlin building in 1917 and still there to this day serving the local community. The market stretches the length of a block between entrances on Broadway and Hill Street (map). In this scene we will meet Yvonne, a young woman who has moved to Los Angeles from her Apache Indian reservation in San Carlos, Arizona. Then ... These bustling shoppers are outside the entrance at 317 S. Broadway. The partially visible 'Broadway' sign in the background is on the corner of 4th Street. ... and Now, downtown merchants no doubt wish for those 1950s shopping crowds but the market is still going strong, as are those same street lamps. Then ... The inside is packed with merchants and shoppers who find their way using the bright neon signs displaying wares and stall numbers. 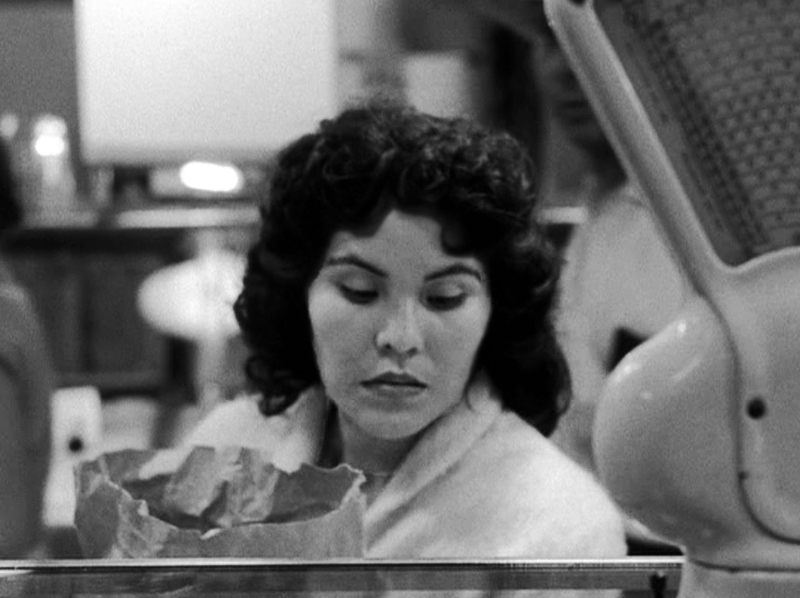 ... and Now, the market conducts business at a more leisurely pace and neon signs still add color but the biggest difference half a century later is the shoppers themselves, mostly latino, reflecting the evolution of the neighborhood. The camera closes in on Yvonne (Yvonne Williams), the first of the movie's three featured characters (all were residents of the neighborhood, none of them actors). As she wanders around the market she shares her thoughts in voiceover with an accent distinctive of the reservation from which she came. She is pregnant and just like any immigrant mother-to-be her main dream is for her child to have a better life than hers. Then ... She leaves the market via its the other entrance, on the 300 block of Hill Street. The view looks towards the shops on the west side of the street and in the upper left corner note the Union Auto parking lot advertising 25 cent parking. Then ... the following movie shot looks over that same parking lot to the east side of Hill Street (the 25 cent sign can be seen but the poster next to it has changed). 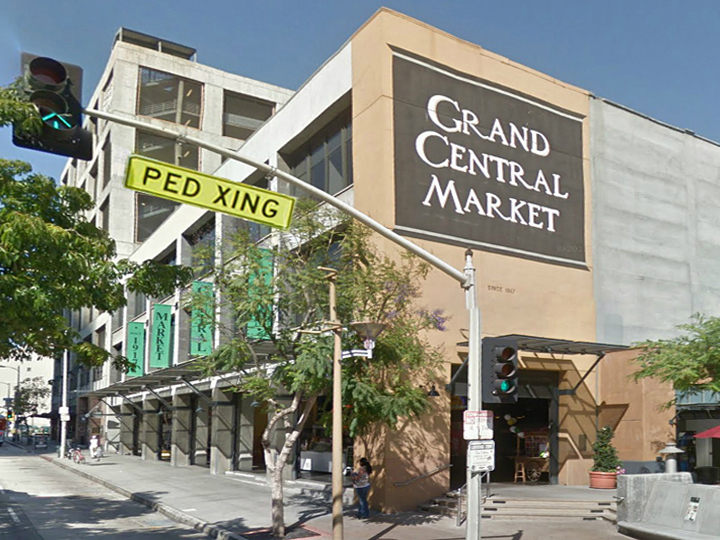 Grand Central Market is at far left, the entrance, above, that Yvonne exited is just out of the picture. Note the other market, how could it compete? ... and Now, the downhill terminus of the relocated Angel's Flight funicular sits on that parking lot today. Grand Central Market is seen across Hill Street at far left. (See where Angel's Flight used to be, here). ... in the 1940s ... this vintage photo was taken over a decade earlier than the movie but it shows us how the market would still have looked when the movie was filmed. ... in the 1960s ... two years after the movie's release the entrance was spiffed up with this gleaming new tile facade. Note too the different street lamps book-ending the market. ... and Now, here's a recent photo of the Hill Street entrance. The two buildings beyond have been replaced by a multi-story parking structure on the corner of 3rd Street and the houses at right are now a small plaza.